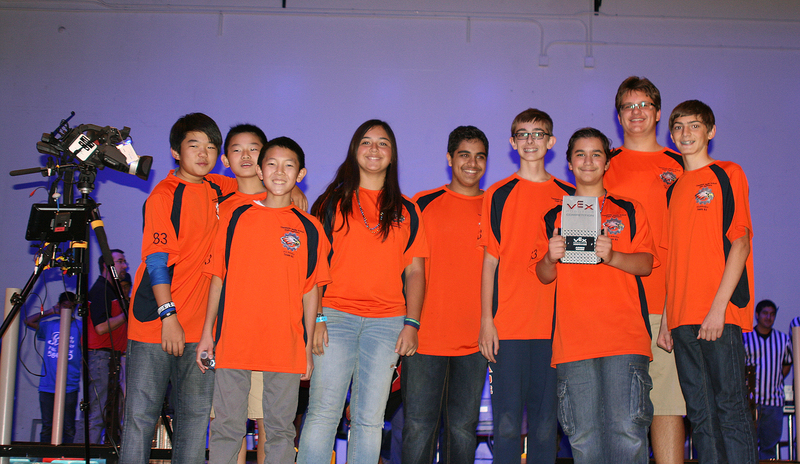 After the Reseda Regents VEX Victory in the Valley Tournament earlier this month, Chaminade’s middle school VEX Robotics Team is now the winner of back-to-back Judges Awards. Team 83 competed against 33 high school and four middle school teams, and ended the qualifying rounds in fifth place with a 7-1 record. During the elimination rounds, they partnered with Creiger Robotics of Lancaster, but lost a hard-fought quarterfinals round 1-2. In the end, Team 83 was recognized with the Judges Award for their solid team work, knowledge of their robot, as well as their overall performance during the tournament. This entry was posted in Academics, Middle School, Robotics by Chaminade News. Bookmark the permalink. I am on the 83 robotics team!